April is National Credit Union "Youth Month" and we're celebrating by hosting a PHOTO CONTEST! 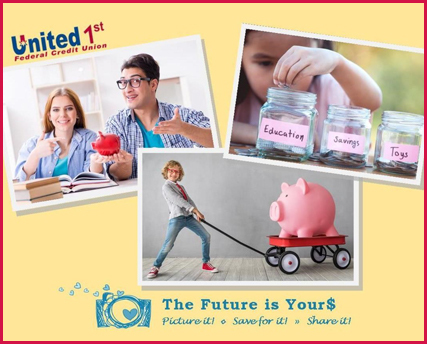 Parents are encouraged to post a picture of your child and the creative ways they have of saving for their future. On April 22nd our panel of judges will select their top three favorites which we will then share on Facebook for all of you to help select the winner. First place will earn $100, second place $50 and third place $25 with all winnings deposited into that youth's account at United 1st. Please click on the link below for instructions on how to enter and the full set of contest rules.